Earlier, I told you about a new book I'd written titled "Folk Art in the Attic". Essentially, it's an account of the major antique and folk art finds I've made in the last 30 odd years. There is also content on the business of antiques, picking, collecting and the impact that antiques have had on my professional and personal life. The book is 17 chapters in all plus a preface and an epilogue. I thought readers of my blog might be interested in having a sample chapter to read. So, here it is! This is the chapter that inspired the book! I hope you enjoy it. It was early on in my collecting life that I developed a fascination for folk art. This was about 30 years ago and at the time most of the attention was being paid to traditional or historical folk art. I migrated more toward contemporary folk art which was just as much fun to collect, easier to find and more affordable. In those days I’d had some luck finding folk art in and around the Ottawa Valley including the work of Arthur Sauvé (1896-1973), an amazing wood carver if not a genius in interpreting his artistic visions and realizing them in wood. Although he carved wildlife, shelves, picture frames, religious items and storage cases for musical instruments, Arthur also experimented with mechanical elements in his carvings as evidenced by his articulated “man on a bike” whirligigs of which only two are known to exist. One is in a Canadian museum and the other, which I found and owned for a time, is now in a private collection. And of course in the Upper Ottawa Valley the wildlife themed carvings of Abe Patterson (1899-1969) are well known and to this day highly sought after. There is the work of Charles Vollrath (1870-1952) from Chalk River, ON. While he also carved animals sometimes of impressive size and scale, Mr. Vollrath also produced carvings in a smaller format. His winged angels are a prime example, executed in a naïve, almost spiritual, yet highly skilled manner. I would put these artists on a par with the famous Bourgault brothers of Saint Jean Port Jolie, Quebec, although the carvings produced by these men are so elegant and well executed that they might be viewed more as fine art than folk art. Regardless, their work, in my opinion, is among the most inspired and magnificent art ever produced in Canada. Art Dixon (1917-2011) was a carver I met in Pembroke in 1983. 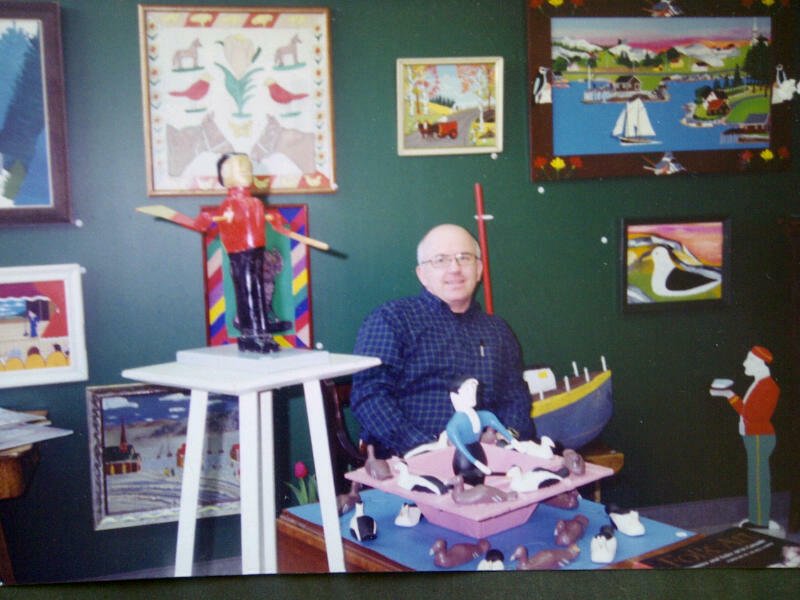 A quiet, gentle man, Art’s basement was filled with wonderful woodcarvings of all shapes and sizes. His three and four foot high examples of lumberjacks, bears and other characters always produce a smile on the face anyone who sees them. Art also painted his carvings with bright and varied colours, which added to their appeal. Like most folk artists, Art was surprised when I expressed interest in buying his carvings but he was happy to oblige. His carving of a lumberjack playing an accordion, mouth wide singing a song, complete with hearts tattooed on his upper arms, remains one of the favourite pieces in my collection. I sold the original one I purchased from Mr. Dixon but he was kind enough to sell me another. 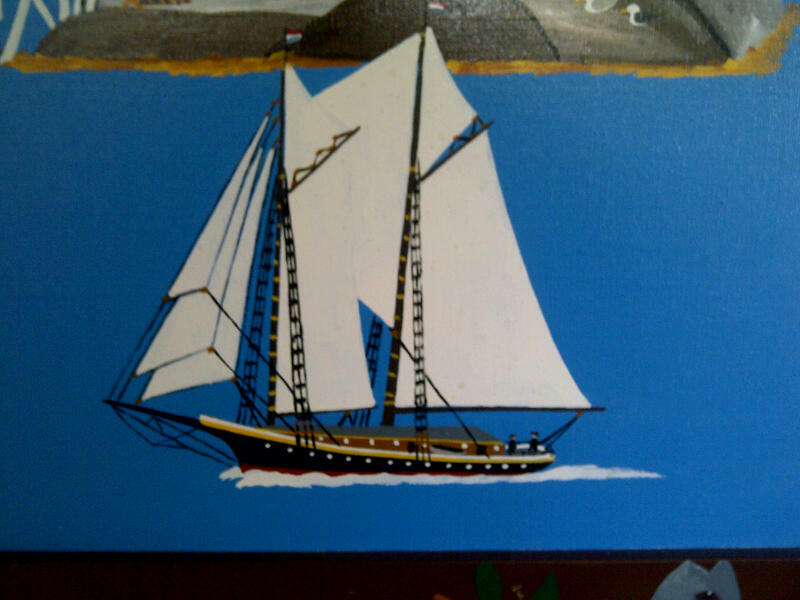 I once came across an elderly man in Brockville and during our roadside conversation; he told me he painted pictures. He then invited me into his home to see his work. We stepped into the front hallway. I wasn’t prepared for what came next. The centre hallway extended the length of the house toward a rear kitchen. On my right was the entrance to the living room with its dining room. It seemed every square inch of the walls in the hallway and the adjoining rooms was covered with his paintings. From floor to ceiling he had hung his artwork literally everywhere. We wandered slowly through his “collection”. There were several pieces I liked and so when it seemed like an appropriate time I asked about purchasing one work in particular. It was a memory painting. The image was of a young girl skipping rope in a summer kitchen of an old farmhouse. All of the items were clearly depicted in the painting including the cast iron stove, harvest table and other pieces of furniture. I raised the notion of buying the painting from him. He looked somewhat startled at the question. “All the time I’ve painted. All these years, I’ve never sold a painting. You’re the first person that’s ever asked to buy one”, he said quietly. “Very few people have even seen them”, he replied. By that time we had returned to the front hall way and I pointed to the large painting of the young girl skipping rope. He gazed at the painting and turned to me. He returned his gaze to the painting and stared at it again for some time. He turned to me. Although I was disappointed, I wasn’t surprised by his response. He had spent years painting these pictures. They decorated his home and he lived with them. While art is bought and sold routinely everywhere in the world, the concept of selling one of his paintings was totally foreign to him. And while he was perhaps tempted at the thought and quietly flattered that I asked him, he could not bring himself to sell even one of his works. I took “no” for an answer and we said goodbye. As the years went by, I often thought about him and occasionally drove by his house when I was passing through Brockville. Then one day a few years after I had first met him, I drove by and the house had a for sale sign on the front lawn. I stopped and asked next door what had happened. As his neighbour stood at the front door, I couldn’t help notice that behind her on the walls of her home were several of the paintings done by the man next door. I got the impression from her that when he left, his family emptied the contents of his home including his paintings. There was little if any family interest in them and they invited her to take them so she gathered up a number of them to use in her home. Like him, ironically, she didn’t want to sell any of them. So, try as I might, apparently, I was never going to own one of this man’s paintings and that remains true to this day. Eastern Ontario and the Ottawa Valley has its share of brilliant folk artists and I enjoyed collecting their works but it wasn't long before I was also drawn to the joyful paintings of Maud Lewis and to the impressive work of Joe Norris and other folk artists from Atlantic Canada. One summer, my wife and I decided to drive to Nova Scotia and look for the work of Maud Lewis, a well-known folk artist. Not surprisingly we did find some but the prices, about $1,500 each, were too daunting for us. (Little did we know what would happen to the prices for her paintings 20 years later.) In any event, we satisfied ourselves buying other art and antiques, which were fun and exciting to find. At the motel one evening, a Quebec picker pulled in with his truck piled high with things. I bought a very nice decorated Flack and Van Arsdale Crock from him and had a good chat. This was the first of two trips we made down east. The second was a repeat of the first, no Maud Lewis paintings purchased but lots of other interesting folk art and antique finds. Later that year, one very cold winter evening, I was in the kitchen at home when the phone rang and the chap on the other end of the line said. "Is this Shaun Markey?" I can remember thinking at the time, who is this guy and what could he possibly have that would interest me. “What artists do you have in the collection”, I asked rather abruptly because I was certain he would describe artists in whom I had little interest. Lewis, Norris, Sleep, Tanner! My goodness, I thought, these are exactly the artists I want to collect and I’ve driven twice to Nova Scotia and came back without anything by them. “Where are you? “I said, trying to keep the excitement out of my voice. He named a street in Ottawa that was literally one minute from my house. I could have crawled there on my hands and knees in 20 minutes and would have gladly done so to have a look at this stash. After establishing how close we were in proximity, I asked when I could come and see the items. Literally, one minute later I was ringing his doorbell at a stately old home, which turned out to be his mothers’ residence. After greeting me at the door, he led me to the stairs. Up we went, two or three flights of stairs until we came to the door of the attic. As he opened the door, he turned to me and said: “You’ll have to excuse the lack of heat in here. We don’t keep it heated at all.” With that he swung open the door and in we went. In antique collecting, like in other walks of life, there are moments that stand out. With antiques, they are those spine tingling moments when, after a great deal of searching, one comes across a significant find. Of course, finding an object you desire is only half the battle. Acquiring the object is the other half and until that happens you must share the feeling of excitement with the tension of not knowing if you can actually complete the acquisition. Anyone who has pursued antiques knows only too well that horrible feeling that comes with losing an item to someone else or, for some other reason, not being able to buy it. The first glimpse of the contents of that room was memorable. It was an unfinished attic with a sharply sloped ceiling that angled toward the floor. All around the edges of the room propped up against the walls was a line of paintings, sculptures and carvings by some terrific Canadian folk artists including: Maud Lewis, Joe Norris, Joe Sleep, Charlie Tanner, Collins Eisenhauer and others plus several more unsigned but impressive folk art examples. I think in all there was about 30 pieces. Included in the group was a beautiful non-winter scene of a cart and driver by Maud Lewis. There was a large Joe Norris’ “cove scene” with his characteristic pink sky in a frame decorated with birds. There was another Joe Norris “seagull portrait” and one of Charlie Tanner’s neat “duck boat” carvings featuring a hunter with a dozen miniature decoys on it’s deck and several more tethered to it meant to float adjacent to the boat as they would in the water in real life. I stood there in the middle of a freezing room, teeth chattering and shivering from the cold and probably the excitement too. I thought to myself: “There’s too much. I can’t handle this or afford it. What am I doing to do?” I wandered slowly about the room picking up one piece after the other. I kept up some meaningless banter while I tried to figure out a plan. Perhaps, I thought, I can buy one or two of the best things, like the Maud Lewis and the Joe Norris and leave it at that. I broached the subject of a partial purchase but he knew wisely that to sell one or two of the best items would seriously undermine the value of the remaining collection. After a final look around the room, we left and went back downstairs to the front hall. We stood there for what seemed like an eternity. I knew it was now or never. I could not leave empty handed. I literally don’t remember the actual words we exchanged at that moment. However, he quoted me a price, which to me was a lot of money at the time. I agreed to the price, or a figure close to it and wrote the cheque there and then, which he accepted. The next hour or so were spent making trips back and forth to the attic to retrieve the works of art and put them carefully into my vehicle. I drove the short distance home. How many times does a wife hear the words “Honey, I just bought a folk art collection!” It was a first for my house, that’s for sure. True to form, Joan was entirely supportive of the purchase of the collection and she enjoyed the moment as I brought the pieces in to show her. At the time of the purchase, I was part of an antique market in the south end of Ottawa. I decided to mount a show and sale of maritime folk art featuring all of the collection. To this day, so many years later, it remains, however modest in scale, the only show and sale of purely Canadian folk art to be staged in Ottawa. The event ran for a week or ten days and sales were reasonably good, despite the recession we were mired in at that time. There were some follow on sales after the fact as well. What didn’t sell found its way back into my collection. Since that day, I’ve gone on to continue to search for and find several more examples of the work by these artists. Whenever I see their work be it by Lewis, Norris, Tanner or any of the other artists in that collection, it brings back the memory of that winter evening when a simple phone call led me to one of the most memorable purchases in my collecting career. If you enjoyed this chapter, you can reserve your personal copy of Folk Art in the Attic by simply sending me an email at shaunmarkey@rogers.com. I'll put your name on the reserve list. No deposit or money is required to do so.